Also known as the Pharmacy Under the Black Eagle, the Pharmacy Museum in Lviv is also the city’s oldest pharmacy. Founded in 1735 by a military pharmacist, it is still an operating drugstore today and continues to mix its “iron wine,” which can be bought as a souvenir. The museum opened in 1966 and now features a collection of more than 3,000 pharmaceutical items, including instruments, medicine bottles, prescriptions, pharmacy-related books and, most notably, an 18th century pharmaceutical scale on display in the Trade Room. The scale is attached to one-meter high figures of the God of Medical Treatment and his daughter, the Goddess of Health. The second room, known as the Material Room, showcases the collection of ancient medicines and pharmaceutical instruments, as well as ancient machinery used for making pills. 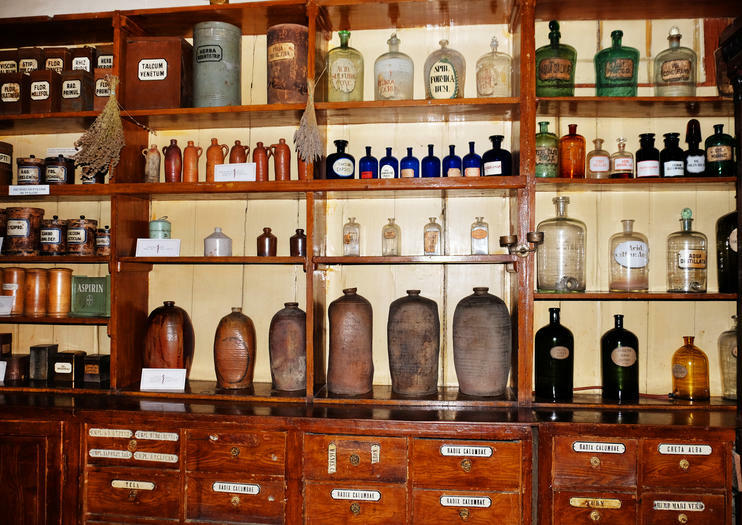 The third room of the museum tells the history of pharmacy dating back to ancient times and the fourth room recreates an old pharmacist’s laboratory and features a collection of rare medicinal plants from all around the world. The Pharmacy Museum is located on Drukarska Street, on the corner of Lviv’s Rynok Square, right in the heart of the city. It is walking distance from most central Lviv hotels. Hours: Daily 10 a.m. to 5 p.m. Discover the top attractions and hidden secrets of UNESCO–listed Lviv on this private walking tour. Explore the narrow medieval streets on foot with your private guide, and discover sites of interest such as the Church of the Jesuits and the Pharmacy Museum. Delve into the Armenian Quarter—home to the Armenian Cathedral of Lviv—visit the Old Town, and admire the monuments, stately homes, and statues for which Lviv is known. With a dedicated guide in the lead, walk the underground passages of Lviv on this private tour. As you pass underneath Lviv's Old Town, hear about the secrets and mysteries that are entrenched in the city's history and stored in these catacombs, more than 62 miles (100 kilometers) long. Visit the dungeons of the Dominican Cathedral and the remains of the Prince Lev Castle, as well as the catacombs under the Pharmacy Museum.